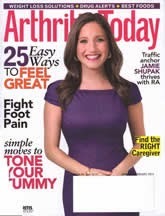 You can get a free subscription to Arthritis Today. This isn't just for "old" people. I know plenty of people including a friend's 6 year old daughter that have arthritis. This is from FreeBizMag. It is completely free, and there are no automatic renewals.